Friday night was date night. After five weeks of client meetings, traveling and conferences without a single day off, I was looking forward to a relaxing evening with my girlfriend enjoying some Indian food and downtime. We had been looking forward to fully exercising a $25 Groupon on a table-full of exotic curries and then catching up on one of our favorite new series. The meal did not disappoint. We left properly stuffed and excited for the rest of the evening’s activities – three episodes of Spartacus. As we walked home we noted how beautiful the evening had become. We made it to the block where I live when my girlfriend noticed something interesting on the ground. We stopped to take a closer look. It was the customer copy of a credit card receipt. Upon closer inspection we discovered that this was no ordinary receipt. In addition to the full credit card number, it had the CVV, expiration date, zip code, phone number, full name and customer signature. And amazingly the retailer managed to write down the customer’s CVV and expiration date but not the total. You can’t make this stuff up. Here it is, blurred for confidentiality. As you can see it contains everything necessary to commit identity theft and card fraud, with the possible exception of one piece of data – the customer’s billing address. So I did what any self-respecting security professional would do – I called and asked for it. Of course, Daniel assumed that because I already had his name and number and that I appeared to be a good Samaritan, that I was worthy of his home address. This is exactly how card fraud is taking place at restaurants, retail stores and hotels across the country. This is not just Daniel’s problem. 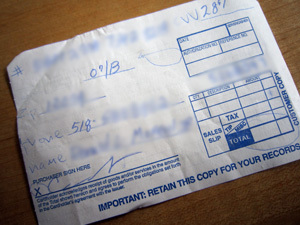 Merchants are instructed to not write additional information on receipts for this very reason. The merchant where Daniel used his card is a prominent and highly regarded institution in the Capitol Region. Just like the Desmond. This week I plan to send Daniel his receipt, along with a note to be more careful. Not just with his credit card and receipts, but with the information that he gives out over the phone. I was a good Samaritan, but the next person may not be. I may also give the merchant a call and offer free advice on avoiding public relations nightmares. And then I’ll just sit back and wait for the good karma to roll in. Good on you, Reg. A couple months ago I got a phone call from one of my creditors to inform me that my card may have been used fraudulently. The agent asked me for my birth date to verify I was Tom B. Instead I grilled her to make sure she was from the company. Even so, I monitored my card usage for a month just to make sure.